In his major-league career Clay Kirby won 75 games, yet he is best remembered for one of his losses. On July 21, 1970, Kirby, on the mound for the San Diego Padres, pitched eight innings of no-hit ball against the New York Mets before manager Preston Gomez removed him for a pinch-hitter. Kirby had given up one run in the first inning on a walk, two stolen bases, and an infield out. The Padres were trailing 1-0 with two out and nobody on in the eighth inning, when Kirby was due to bat. Gomez sent Clarence “Cito” Gaston to the plate. Gaston struck out. The Mets scored two runs on three hits and a walk against a relief pitcher in the ninth inning and won the game, 3-0. Many Padres fans, irate that Gomez had deprived the youngster a chance of a no-hitter by removing him from the game, booed long and loud. The manager’s decision became a matter of intense controversy. Was Kirby treated unfairly by being removed from a potential no-hitter? Was Gomez fulfilling the manager’s responsibility by making the move that he thought gave his team its best shot at a victory? Clayton Laws Kirby, Jr. was born in Washington, D.C., on June 25, 1948, the only son of Gloria Deener and Clayton L. Kirby. Clay and his sister Carolyn both grew up in suburban Arlington, Virginia. Clay started playing Little League baseball at the age of 7 and went on to play baseball, basketball, and football at Washington and Lee High School. In one high-school contest he pitched a perfect game, while striking out 19 batters. Kirby was selected by the St. Louis Cardinals in the third round of the June 1966 amateur draft. He was signed to a contract by St. Louis scout Charles “Tim” Thompson and assigned to the Sarasota Cardinals of the rookie Gulf Coast League, and soon earned a promotion to St. Petersburg of the Florida State League, where he won his three starts, giving up only nine hits in 20 innings. He spent 1967 with Modesto of the California League. During his first two offseasons he attended Old Dominion University in Norfolk, Virginia, and Benjamin Franklin University in Washington, respectively. He started the 1968 season between Arkansas of the Double-A Texas League and then advanced to Tulsa of the Triple-A Pacific Coast League, winning 12 games as a starting pitcher for the two teams. At the end of the 1968 season the 20-year-old right-hander was chosen by the new San Diego Padres in the expansion draft. Kirby was the sixth player taken by the Padres. Kirby made the Padres squad in spring training and the 6-foot-3, 175-pound right-hander made his major-league debut on April 11, 1969, against the San Francisco Giants. Giving up four runs in four innings, he was the losing pitcher. His teammates dubbed the fuzzy-cheeked youngster “The Kid.” In his rookie season Kirby led the National League in losses with 20, but the Padres were not discouraged. Pitching coach Roger Craig said, “The Kid has a lot of Drysdale’s competitive drive. When he was 20 in his rookie year, he wasn’t afraid. And when he lost 20, it didn’t get him down. I told him he had to be a pretty good pitcher to lose 20 games, because it means he was getting the ball every four days.”1 Gomez said he thought Kirby and fellow rookie Al Santorini were both potential 20-game winners. “They both have great arms and all they need to become complete pitchers in the major leagues is experience,” the skipper said.2 Kirby shared his manager’s confidence in his ability. One of his teammates, pitcher Steve Arlin, said of him, “Clay was cocky, brash, arrogant, and still very popular. He was a young kid who did not back down from anything or anybody. He could beat the world and he knew it.”3 But with the woeful Padres behind him he could not beat the majority of major-league clubs he faced. In five years with San Diego he had only one winning season, and won 52 games while losing 81 for a less-than-stellar .391 winning percentage. However, Kirby did have some outstanding games. In fact, he almost pitched three no-hitters for the Padres. The season after the game in which Gomez lifted him for a pinch-hitter, Kirby pitched no-hit ball at Houston for 7⅓ innings on September 13, 1971, before Johnny Edwards broke it up with a double. Kirby lost the game 3-2, as the Padres committed two infield errors in the ninth inning, allowing the winning run to score. In his next start, at San Francisco on September 18, Kirby set down the first 21 Giants to face him and was in pursuit of a perfect game until Willie McCovey started the bottom of the eighth inning with a home run. It was the only hit Kirby gave up in the game as the Padres won, 2-1. When he joined the Reds, Kirby asked for uniform number 31. “That’s the opposite of 13; Maybe it will change my luck,” he said.8 In his third start for the Reds, in Cincinnati on April 16, Kirby retired 16 of the first 17 Los Angeles Dodgers batters he faced and was working on a one-hit shutout when pitcher Andy Messersmith hit a home run in the sixth. Kirby left the game with a stiff back after seven innings, and the Reds lost the game in extra innings. He fared better in a game against Houston on May 12, when he carried a one hitter into the ninth and survived a home run to win a two-hitter. But despite having the powerful Big Red Machine behind him, Kirby never became the 20-game winner he aspired to be. In 1974 he won 12 games. In 1975 his victory total fell to 10. 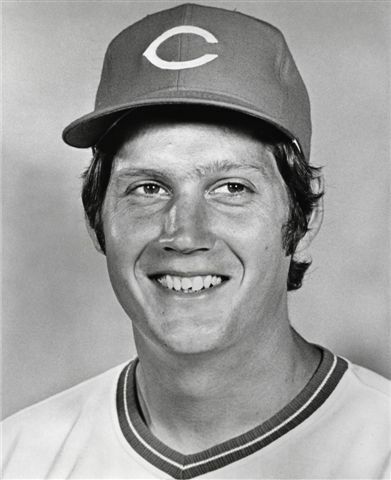 In 1974 he ranked fourth on the Reds in wins behind Don Gullett, Jack Billingham, and Fred Norman. The return of Gary Nolan, who had missed almost two full seasons with shoulder trouble, and the arrival of Pat Darcy in 1975 further reduced Kirby’s opportunities, and he became a spot starter and an occasional reliever. In his two seasons with the Reds, Kirby won 22 games against 15 losses for a respectable .595 winning percentage. To his dismay, he did not get into a single postseason game after Cincinnati won the 1975 National League pennant. Newspapers reported that if the World Series went beyond five games, the “baby-faced” hurler would get a start against the Boston Red Sox. The Series went the full seven games, but Kirby never got his shot. After the season was over, a Cincinnati newspaper conducted a poll of fans to see which Reds players they would most like see traded away. Kirby collected the most votes. Not that the poll had anything to do with it, but in December the Reds traded Kirby to the Montreal Expos for infielder Bob Bailey. In January 1976, Kirby was stricken with a long bout of pneumonia before he joined the Expos in Florida for spring training. He was still weak and had a sore shoulder when the season opened. He got off to a miserable start and never recovered. He won only one game for the Expos, lost eight, and posted a 5.72 earned-run average, while walking 63 batters in 78 2/3 innings. After all the major-league clubs passed on Kirby in the offseason, Montreal released him on December 2, 1976. In January 1977, the Padres decided to give their former pitcher another chance. They invited him to their spring-training camp in Yuma, Arizona. Kirby’s string of bad luck continued when he incurred a knee injury in the final week of spring training. His comeback try was delayed for almost two months. The Padres sent him to their Pacific Coast League farm club in Hawaii. He won his first game for the Islanders on June 18, but never won another. His record for the season was one win, seven losses, and an earned-run average of 7.95. After San Diego gave up on Kirby, he tried out with the Minnesota Twins during spring training in 1978. He lasted only two weeks before he was released. Kirby’s career in Organized Baseball was over before his 30th birthday. His family continued to live in San Diego County until 1983, when they returned to Virginia. Kirby became a self-employed financial securities broker. For several years he was tournament chairman for the Major League Baseball Players Alumni in golfing events to benefit the American Lung Association. On July 19, 1991, Kirby underwent a coronary atherectomy to open a blockage in an artery just above his heart. After the procedure he was advised that he had suffered a silent heart attack. The Kirbys had been living with his mother in Arlington. His sister said they thought Clay was recuperating nicely, but she later learned from friends that he had been complaining about chest discomfort and numbness in his arm. He apparently died of a heart attack on October 11, 1991, at the age of 43. His wife found him about 11 o’clock in the morning in his easy chair. It appeared that he had fallen asleep while reading and suffered the fatal attack. He was survived by his wife, Susan; his mother, Gloria; his sister, Carolyn Twyman; his son, Clayton; his daughter, Theresa Schoengold; and two grandchildren, Derek and Brandon Schoengold. He was buried in the National Memorial Park in Falls Church, Virginia. This biography is included in SABR's "The Great Eight: The 1975 Cincinnati Reds" (University of Nebraska Press, 2014), edited by Mark Armour. For more information, or to purchase the book from University of Nebraska Press, click here. In addition to the sources cited in the Notes, the author also relied on baseball-reference.com, retrosheet.org, and his book Major League Careers Cut Short: Leading Players Gone by 30. (Jefferson, North Carolina: McFarland, 2011). 1 Paul Cour, “Kirby Rewards Patient Padre Bosses,” The Sporting News, July 3, 1971: 10. 2 Paul Cour, “Hill Stars of Tomorrow: Padres’ Kirby, Santorini,” The Sporting News, August 30, 1969: 15. 3 San Diego Union, October 17, 1991. 4 Cincinnati Reds News Release, “Reds Get Clay Kirby from San Diego,” November 9, 1973. 5 “National League,” The Sporting News, August 25, 1973: 31. 6 Cincinnati Post, May 18, 1974. 8 Cincinnati Post, May 18, 1974. 9 San Diego Padres Press Release, “Padre Close Up.” June 19, 1971.